We are a source for seeds, plants and agricultural products grown on the Big Island of Hawaii. Our unique environmental conditions allow for a huge assortment of unusual plants, flowers and fruits to be grown here. Our attempt is to share some of this natural wonder with the rest of the USA. When possible we offer seed gathered from high elevation sources in an effort to find hardier plants for mainland growers. The primary focus of our collection is on edible plants but herbs and native plants are also included. We are constantly seeking new and exciting selections for our collection. We hope you enjoy and have success with our products. Bill "The Green Garden Guy"
Prices include domestic shipping and can be shipped to any US state or territory. Local Hawaiian taxes are applied to the sale. Unfortunately, at this time, we cannot accept non-domestic (foreign) orders. Hawaiian native tree. One of the most valuable hardwood trees in the USA. Prime cuts can sell for up to $250 per board foot. The beauty of the grain is unique. It has the effect of cutting light similar to a tigers eye gem stone when polished. The tree is hardy enough to stand light frost so coastal California is within possible growth range. The seed is slow and difficult to germinate. Nick seeds on the long edge with a finger nail clipper then soak in 140 degree water. Allow seed to cool in water over night and plant the next day. Cherimoya Annona cherimola Cherimoya is the most popular and one of the best eating members of the Annona family. On Mark Twain's first trip to South America, upon tasting the fruit, he declared it to be "Deliciousness it's self". The plant grows easily in HI, CA & FL but it is possible in other mild climate areas. It can tolerate short periods of temperatures below freezing. Guanabana Annona muricata A delicious member of the Annona family, related to Cherimoya & Pawpaw. The tree is more tender to cold than Cherimoya and can not tolerate freezing weather. Southern California, Hawaii and Florida are the only states of the USA where it can be grown in the orchard. The juice is nicely sweet and acid. It makes excellent juice or frozen desserts. This local variety of the red skin peanut grows very well in Eastern Hawaii and has excellent eating quality. Jack Fruit Artocarpus heterophyllus This tropical fruit is the flavor of Juicy Fruit Gum. Trees can fruit in as little as 4 years from seeds. The green fruit is used as a vegetable. The seeds are eaten like almonds and the fruit is large enough to feed a family. Next to water and tea coffee is one of the most popular beverages on Earth. Interest in raising this crop has even spread to Coastal California recently. The plants are actually quite tolerant to cold because of their mountain origins. The Dwarf Caturra variety originates in Brazil and has become a very popular type in Hawaii because it's small size works for machine harvesting and it thrives in the cool wet conditions found on the windward side. Caturra is early maturing and grows to about 6 feet high. Kona coffee is the most famous coffee raise in the USA. It originates in Guatemala in the 19th century but has become it's own land race in Hawaii due to the fact that it is always grown from seed. It is a tall coffee type easily growing to over 16". In the West Hawaii climate it makes a nice robust coffee that is one of the most famous and expensive on Earth. Gandules Cajanus cajan Excellent tropical legume good for stick mulching and nitrogen fixing. The peas are an important ingredient in Arroz con Gandules. Also known as Honto rice. Cananga tree Cananga odorota Cananga odorata, a relative of the Cherimoya, is known as the cananga tree. It is a tropical tree that is native to Indonesia, Malaysia, and the Philippines. It is valued for the perfume extracted from its flowers, called ylang-ylang. This name also sometimes used for the tree itself which is an essential oil used in aromatherapy and one of the notes in perfume like Channel #5. This South American pepper is very productive and lives for years in mild climates. I have grown bushes up to 8 feet tall in California. Mildly hot, good flavor. Sweet top shaped cherry size peppers that ripen red with wonderful Habanero like fragrance. Very hardy and unusual pepper. This Tabasco like chili is a popular garden perennial here in Hawaii. This is the pepper used for making the locally famous chili pepper water. Chili, garlic, ginger, salt vinegar and water are mixed to make this sauce. It uses just enough salt and vinegar to preserve the condiment. Exotica Papaya Carica papaya This is a favorite Papaya for people that do not like GMO papaya fruit. It is mostly hermaphrodite plants and does not easily cross with other papaya. The fruit is tastier than the classic Solo. Papaya is one of the most popular tropical fruits next to banana and pineapple. They are relatively quick to fruit, less than 2 years from a seed. The Hawaiian Solo is a dwarf plant that is non-GMO and self fertile. It is the most popular papaya in the USA today. Needs warmth and good drainage. This local specialty appears similar to the Calabaza squash of Central America and the Caribbean. If it wasn't enough that it will resist attacks from pickle and melon worms but it is also the best eating squash I have ever grown. It is a long season vine with extended lifespan so it will not work well in the northern areas of the USA. The vine will root at almost every leaf node making it the unstoppable Godzilla of the squash kingdom. This perennial relative for the tomato originates in the Andes of South America. It was one of the lost crops of the Inca. This variety is a new one from New Zealand that is much sweeter than previous introductions. The flavor is very much like a tomato and can be used in the same way. Tomatoes are very prone to disease here in Hawaii but this crop seems completely resistant. Bill sample that Hawaiian favorite the Mountain Apple. Otherwise know as Eugenia malaccense or Syzygium malaccense. Purple Mangosteen Garcinia mangostana This eggplant purple fruit has white segments inside that resemble a tangerine. The fruit has a cult following as a health food and as the queen of the fruit world. It is very delicious, one of the finest fruit the earth has to offer. The seed can not be dried so it must be shipped fresh from the fruit. The fruit commands one of the highest prices in the market place. Mangosteen seed can not be dried. It must be removed fresh from the fruit, wrapped in moss and shipped rapidly. The seed will often begin to ferment slightly in shipping, this is normal and does not harm the seeds. This is the edible Hibiscus plant from Africa used to make the Mexican beverage Jamaica or Red Zinger tea. Easy to grow. It is the fruit that is used. It makes an excellent substitute for cranberies. In the USA this plant is know from it's use in "Red Zinger Tea". In the Caribbean, sorrel drink is made from the calyx. Mexican restaurants in the USA sell the drink under the name Jamaica. It is prepared by boiling dried calyx in water for 8 to 10 minutes and then adding sugar. It is often served chilled. Health benefits include lowering blood pressure and flushing the kidneys. The dried product is $6 per once. The price includes the $3.50 postage. If you have eaten sweet corn in Hawaii then you know how good this stuff is. After my first taste I brought the seeds back to California with me and found it grew fine there too. One of my favorite sweet corns and very resistant to diseases. This south east Asian tropical tree has delicious fruit that comes in red capsules. They ship well and are becoming a popular fruit in some regions of the USA. The trees come as male, female or hermaphrodite so plant several if growing from seed to insure pollination. Rambutan seed can not be dried. It must be removed fresh from the fruit, wrapped in moss and shipped rapidly. The seed will often begin to ferment slightly in shipping, this is normal and does not harm the seeds. This is the favorite passion fruit of Hawaii. Easy to grow and prolific producer of fruit. Great for drinks, sauces and jelly. Very heavy perfume. Passion fruit seed can be difficult to germinate. You can speed things up by scarifying the seeds on a sheet of sand paper and then soaking in 140 f. degree water. Allow seeds to cool in water overnight and plant in the morning. This is one of the finest tasting, conservative growing and beautiful passion vines on earth. In some areas it requires hand pollination but the fruit is worth it. Passion fruit seed can be difficult to germinate. You can speed things up by scarifying the seeds on a sheet of sand paper and then soaking in 140 f. degree water. Allow seeds to cool in water overnight and plant in the morning. This plant produces beautiful leaves, fabulous flowers and the largest fruit of any passion flower. The juice is sweet, there is more than most passion fruit and the rind is edible as fruit or vegetable. Popular native Hawaii fruit. Used for jams and jelly or dried into a beautiful golden raisin. Delicious grape like fruit that grow right off the side of the tree trunk. 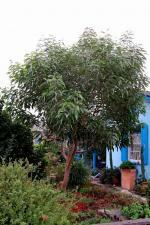 This good looking tree can also be grown in mild climate parts of the mainland USA like Coastal California and Florida. Inca Peanuts Plukenetia volubilis Sacha inchi is touted by many as one of the world’s healthiest super foods. Also known as Inca peanuts. They are among the richest sources of omega fatty acids in the world. They are loaded with protein, fiber and antioxidants. They have been grown and eaten in the Andes of Peru for many years. Pouteria caimito or Abiu is a tropical fruit tree originated in the Amazonian region of South America. It will grow an average of 33 feet (10 m) high. The fruit shape varies from round to oval with a point. When ripe, it has smooth bright yellow skin and will have one to four ovate seeds.The inside of the fruit is translucent and white. It has a creamy and jelly-like texture and its taste is similar to a sweet vanilla custard. Trees can bear fruit in as little as 4 years from a seed. I find it one of the easier tropical fruit trees to grow and the fruit is delicious. This member of the Annonacea is related to Cherimoya but is much easier to grow. It will fruit in three to four years from seeds and is self fertile requiring no hand pollinating. In areas with good rainfall and mild winters it is a very easy crop to grow. This fruit appears to be a natural hybrid between the Rollinia delicosa and the Annona reticulata. It has the flesh of the Rollinia and the appearance of the Custard apple. Fast growing and productive tree. Of all the dragon fruit I have tried this one is my favorite. It grows easily, bears young and has the sweetest fruit of all. Chocolate is one of the most well known foods on earth yet few of us ever try to grow our own. Theobroma cacao, also called the cacao tree is a small evergreen tree growing to about 20'. It is native to the deep tropical regions of Central and South America. Its seeds, called cocoa beans, are used to make cocoa powder and chocolate. Cacao seed can not be dried. It must be removed fresh from the pod, wrapped in moss and shipped rapidly. The seed will often begin to ferment slightly in shipping, this is normal and does not harm the seeds. Naturally grown Hawaiian Habanero chili. No spray grown, with organic fertilizers. Perfect BBQ seasoning. The dry peppers are $8 per ounce. Shipping is $8 and is included in the total price. Dried naturally grown bananas from the Green Garden Guy's farm. Grown with organic fertilizers and no spray. A natural candy snack from the Islands. Incredible in baked goods like cookies. Prices include shipping. Prices are shown with shipping included. The fruit is $2 per ounce. Shipping on 1 to 2 ounces is $3.50. Shipping for 3 to 8 ounces is $8.00 The product and shipping price are combined. Shipping is included in cost. Mamaki is found only in Hawaii. It is known as an herbal remedy for lowering high blood pressure, reducing cholesterol, regulating sugar and cleansing toxins from the blood. It supports liver, stomach, colon and bladder health. It contains the antioxidants catechins, chlorogenic acid and rutin. As if that wasn't enough it makes a very tasty tea served hot or cold. The tea is $10 per ounce with $8 shipping charge included in the cost. Prices are for plants picked up at Bill's farm on The Big Island of Hawaii. If you do not live in Hawaii county but wish to purchase plants please contact Bill directly at 808 968-6148 or greengardenservice@yahoo.com for arrangements. Sales to CA, AZ, TX & LA are prohibited. Local Hawaiian taxes are applied to the sale.